WASHINGTON — No filmmaker in the history of Hollywood has delivered as many beloved blockbusters as Steven Spielberg, from “Jaws” (1975) to “Raiders of the Lost Ark” (1981), “E.T.” (1982) to “Close Encounters” (1977), “Jurassic Park” (1993) to “Saving Private Ryan” (1998). But his crowning artistic achievement undoubtedly remains “Schindler’s List” (1993), which returns to movie theaters Friday for a special 25th anniversary presentation from Dec. 7-13, marking a quarter century since the Holocaust epic won seven Oscars, including Best Picture. It comes at a powerful time, just a year after neo-Nazis chanted “Jews will not replace us” in Charlottesville, Virginia. While there’s no substitute for documentaries like “Night and Fog” (1955) and “Shoah” (1985), “Schindler” is the best narrative film to capture the horror of the Holocaust and the spirit of the survivors, showing the journey of Oskar Schindler, a wealthy member of the Nazi Party, who saw the light and risked his life to save 1,100 Polish Jews. “‘Schindler’s List’ is like looking through a tiny little pinhole at the most monstrous event of man’s inhumanity against man in recorded history,” Spielberg said in the DVD director’s commentary, his images still seared into our brains: ashes of flesh falling like snowflakes; conveyor belts dropping emaciated bodies into fire pits; a boy desperately hiding in a latrine. Today, “Schindler’s List” is celebrated by both the critics and the public, voted No. 8 on the American Film Institute’s Top 100 and tied for No. 5 on the Internet Movie Database fan poll. So, 25 years later, what exactly makes “Schindler’s List” simultaneously revered and beloved? It’s no secret that the root of every great movie is a great screenplay. Screenwriter Steve Zaillian, who went on to write “Gangs of New York” (2002) and “Moneyball” (2011), deservedly earned an Oscar for his adaptation of Thomas Keneally’s acclaimed novel “Schindler’s Ark.” The title is fitting, considering the entire biopic charts “Schindler’s arc,” as in his character arc. Throughout this transformation, Zaillian walks the tonal tightrope, mining eye-watering inspiration from the depths of darkness, just like the film’s two colleagues in the AFI’s Top 3 Most Inspirational Films: “To Kill a Mockingbird” (1962) and “It’s a Wonderful Life” (1946). For all this, Zaillian’s script ranked No. 49 on the Writers Guild of America’s Top 101 Screenplays. Such character arcs would not have worked if not for great performances. Today, audiences mostly recognize Liam Neeson for his very particular set of skills in “Taken” (2008), but his career role will always be Oskar Schindler, creating the AFI’s No. 13 Greatest Hero of All Time. On the dark side of the same coin is Ralph Fiennes, known to a new generation as Voldemort in “Harry Potter” (2001-2011) but never better than as Amon Goeth, sniping prisoners from his balcony before taking his morning piss, creating the AFI’s No. 15 Greatest Villain of All Time. “All of us on the set had this enormous privilege of being the voice of a terrible period and saying, ‘Ladies and gentlemen, it breaks my heart to tell you, but it’s all true,'” Kingsley said. Even with the script’s eloquent dialogue and actors’ power performances, it would not have had the same emotional impact if not for the proper score playing our emotions like a piano. For this, Spielberg turned to his favorite collaborator, composer John Williams. The result will live on long after Williams is gone. After scoring “Jaws,” “Star Wars,” “Close Encounters,” “Superman,” “Raiders of the Lost Ark,” “E.T.” and “Jurassic Park,” Williams somehow topped himself again with “Schindler’s List” with a heart-wrenching violin bow sliding across our heart strings. It earned Williams his fifth Oscar for Best Original Score. It was worth the wait, as Spielberg matured from the maker of mass entertainment to true cinematic artist, finally winning his overdue Oscar for Best Director and setting up his second win five years later for another powerful World War II film, “Saving Private Ryan” (1998). Slow Disclosure: Like Hitchcock’s introduction of Cary Grant in “Notorious” (1946), Spielberg introduces Schindler without showing his face. Instead, we get close-ups of his belongings: a cuff link, a tie loop, an arm moving through a sleeve, a pocket handkerchief, Reichsmarks, a watch, a Nazi pin. We then follow Schindler in a tracking shot, staring at the back of his head, allowing him to leave the frame, then waiting for just the right time to show our hero’s face. Transitions: You’ll also find clever transitions, from flashbulb freeze frames echoing “Raging Bull” (1980) to typewriter screen wipes echoing “All the President’s Men” (1976). The most powerful transition comes as Spielberg tilts upward on the rising smoke of a contemporary Jewish holiday candle, then tilts back down on the smokestack of a 1940s train. The most disturbing is a cut from a Mazel-tov glass smash to Goeth’s brutal beating of Helen Hirsch. Montage: Helen’s beating also displays Spielberg’s use of montage in the rapid cutting of images. The technique is most effective as Schindler auditions various secretaries. With each cut, Schindler gets closer and closer to the attractive applicants, until finally, we cut to an unattractive typist where Schindler sits far away, unimpressed. Without any dialogue, Spielberg has visually painted Schindler as a shrewd womanizer, using distance between two characters to make a point (like Welles at the dinner table with his wife in “Citizen Kane”). Single Take: Of course, quick cutting is not always best. Different scenes call for different directorial techniques. As Goeth’s gun jams in a failed attempt to execute a Jewish worker, Spielberg uses a long take as we experience the real-time suspense along with the victim. Power Angles: In addition to the duration of the shot, the angle of the shot is equally telling. When Schindler’s wife Emilie walks in on him with his mistress, we cut to a high-angle shot where the wife is larger in the frame, looking down on a small Schindler. The contrasting angles subconsciously suggest he is emotionally smaller. His wife has the moral high ground. Mise-en-scène: Sometimes, entire shots feature symbolic composition, such as the wide shot of Neeson and Fiennes with a vertical shadow dividing them. When Helen enters, she stands on Schindler’s side, visually begging him to save her from Goeth. Also, note Spielberg’s shots through window panes. The first time we meet Schindler in his greedy Nazi state, he appears to the left side of a pane. After he attempts to save Jewish workers, note that Goeth is now on the left side of the pane and Schindler is on the right — now on the right side of history. Diegetic Sound: Throughout the film, Spielberg blends these visual techniques with powerful audio elements. During the liquidation of Krakow, a high angle shows the town windows lighting up with flashes of gunfire to a chillingly upbeat Bach piano accompaniment. This music is played by a Nazi soldier, highlighting the difference between diegetic sound (coming from an on-screen source) and non-diegtic sound (emanating from an off-screen source). Symbolic Color: This black-and-white reality is momentarily broken by a famous touch of red. As Schindler watches the 1943 liquidation of the ghetto, he focuses on a young girl wearing a red coat as she makes her way through the chaos. This highlights the importance of a single, solitary life, setting up a shock wave of emotion when we later get the payoff. The actress who played the young girl, Oliwia Dabrowska, reportedly regretted watching the traumatic film at such a young age and vowed to never watch it again. Ultimately, she promised Spielberg that she’d give it another shot upon turning 18 and realized she was part of something special. Likewise, we should all give “Schindler’s List” another look. The 25th anniversary rerelease in modern formats — 4K, Dolby Cinema and Dolby Atmos — is the perfect opportunity to do so. 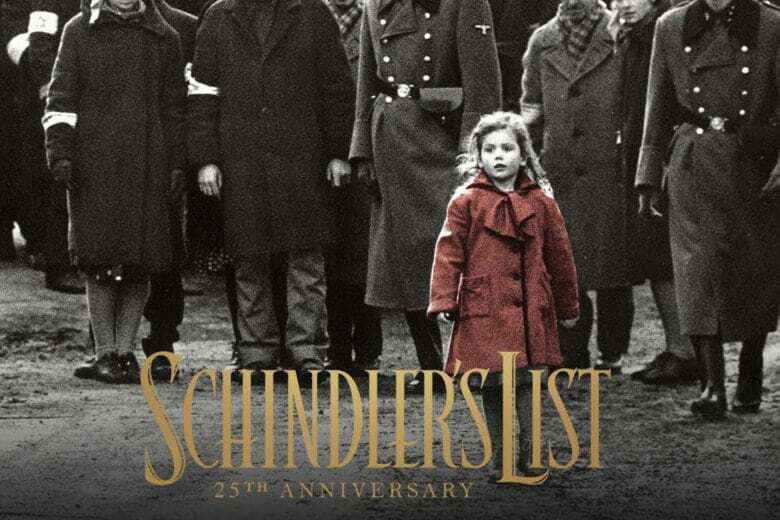 Granted, a lot has changed since “Schindler’s List” as Spielberg delivered a “Why We Fight” Holocaust episode in HBO’s “Band of Brothers” (2001); Roman Polanski won Best Director for his Holocaust epic “The Pianist” (2002); Quentin Tarantino provided revisionist revenge in “Inglourious Basterds” (2007); Kate Winslet won an Oscar in “The Reader” (2008); and Hungarian director László Nemes won Best Foreign Language Film for “Son of Saul” (2015). But the more things change, the more they stay the same, from the Holocaust denials of Iran’s Mahmoud Ahmadinejad to the aforementioned events of Charlottesville. In this light, it’s all the more important for prominent voices to keep the Schindler candle burning.